Ex-Colombian President Gaviria shares his 1990 to 1994 illegal drugs war that takes down international drug trafficker Pablo Escobar. He said, using military forces is one of his mistakes because it created more problems. Digong is quite irked with the remarks and explains that both countries deal with different kind of illegal drugs. Gaviria dealt with heroin, cocaine, and marijuana. Whereas the Philippines deals with Shabu. Shabu is a slang term for the drug methamphetamine used in Japan, Hong Kong, Malaysia and Indonesia Philippines. It’s also called “Ya ba” in Thailand which means crazy medicines. They are pills with a mixture of methamphetamine and caffeine prevalent throughout Asia. Unlike the three common illegal drugs, Shabu can immediately twist the brain of the taker. Once seriously addicted to it, one can’t comprehend normal conversation anymore, said the President. [VIDEO]: TJ Manotoc keeps us in the loop on former Colombian President Cesar Gaviria’s comments on President Rodrigo Duterte’s on-going campaign versus illegal drugs. Gaviria discloses that tens of thousands of people are slaughtered in their anti-drug crusade. Many of their brightest politicians, judges, police officers and journalists are assassinated. This is feared also in the Philippines because even people from the police, politics, show business industry, businessmen, and media people are not spared with being addicted to illegal drugs. However with shabu, if they are already seriously hooked, rehabilitating them is already a great challenge. Besides, they can’t be the brightest anymore if that is the case with shabu’s intense effects. Besides, the enormous funds from drug cartels are spent to corrupt Colombian officials in the executive, judicial and legislative branches of government. This is quite similar to the Bilibid prison cases that involve Senator Leila De Lima which is still under investigation. Various officials receive bribes from drug lords. It is also impossible to intercept shabu users without the police or military because a conversation is not feasible anymore. 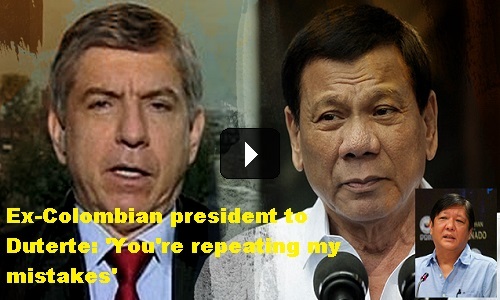 The Philippine president thinks that it is stupid to compare the Colombian illegal drugs campaign with the local drug war. Gaviria’s recommendations are already in the country. These go along with rehabilitations, community support, and livelihood programs. Politicals also challenge each other to take drug tests after rumors escalate against political enemies. There is even a rumor that Bongbong Marcos is a cocaine user. It stops when he takes on the challenge for the drug test. Gaviria explains that the war on drugs is a “war on people” and that more and more administrations see the need for a practical approach to dealing with illegal drugs. Improving public health and safety can reduce illegal drugs supply. Sustainable investments strengthen anticorruption measures. To decriminalize consumption and ensure that governments regulate harmful drugs help. Medical and recreational purposes must be clearly defined. The Philippine administration prides itself in doing various drug rehabilitation programs. It taps private investors to put up additional drug rehabilitation facilities.